There is all kind of weather in the forecast over the next few days as we start spring: rain, wind, flooding, thundershowers and even snow. There is a wind advisory in effect until 11 PM. Strong winds 15 to 30 MPH with gusts to 50 MPH are expected behind the cold front that is moving across the area. Forecasters say the strongest winds will be this afternoon (Wednesday) and evening. Winds this strong can break small tree branches and cause local power outages. Heavy rain along the lower slopes of the Olympic Mountains last night and this morning could drive the Skokomish River to flood stage this (Wednesday) afternoon. So a flood watch is in effect through this evening as up to 2 inches of rain fell in the Skokomish Basin overnight and another 1 to 2 inches is possible today. 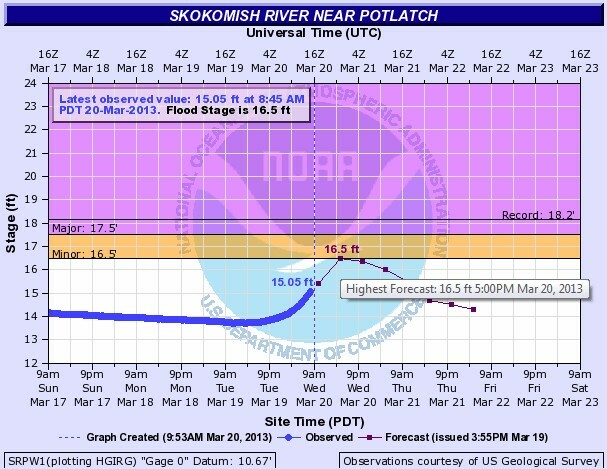 This could cause “brief minor flooding of the Skokomish”. The specific forecast for the River shows it reaching the 16.5 foot flood stage about 5 PM and then slowly receding. 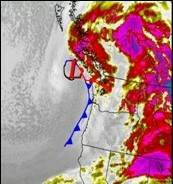 Some areas will see thunderstorms and there is snow in the forecast tonight through Friday. Most areas will see mostly rain before 11 PM. The snow level will drop to about 700 feet and a mix of snow and rain are possible overnight. This mix is expected to change to rain after 11 AM Thursday but little or no snow accumulation is expected. There are scattered rain showers forecast for Thursday night before 11 PM and then scattered rain and snow showers but again little or no snow accumulation is expected. And on Friday there is a 30% chance of rain and snow showers, otherwise partly sunny with little or no snow accumulation expected. Only rain is forecast for the weekend.Of course, those at higher elevations and in more outlying or remote areas could see maybe an inch of snow before changing to rain.